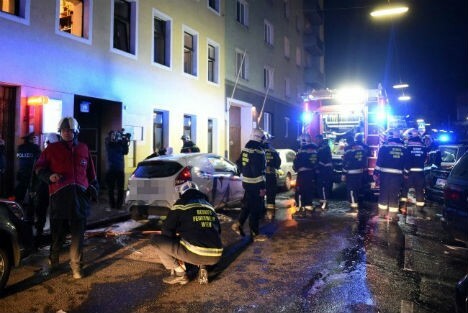 Thirty-one people were injured, two of them seriously, after a fire broke out in an apartment building in Vienna’s Favoriten district on Monday evening. Around 100 people had to be evacuated from their homes. It’s still not clear what caused the blaze. Twenty-one people were taken to hospital, including nine children, Vienna ambulance spokesman Andreas Huber said. One man is being treated for severe burns, and another for severe smoke inhalation. The fire broke out at around 10.30pm in a basement apartment of a building in Gellertgasse. “The flames spread rapidly, but we still don’t know what caused the fire in the first place,” Vienna Fire Brigade spokesman Christian Feiler said. 60 firemen, 14 fire engines and seven ambulances were on the scene. When the first fire engine arrived the burning basement apartment was engulfed by flames, and people were panicking. “It was a massive job just to reassure people that they would be safe,” Feiler said. 35 apartments in two adjoining buildings had to be evacuated and the injured were given first aid and oxygen. The couple who live in the basement flat where the fire started were both rescued. The blaze was extinguished shortly after 11pm.